Why You Shouldn’t Fear Tax Day! Taxpayers sometimes exhibit apprehension as the 15th of April rolls around. There’s a lot of misguided fear that bubbles to the surface associated with what and how we pay the IRS. While there’s a few reasons for legitimate concern in some areas, overall it should never escalate to the point of acting irrational. When the tax man cometh [as he always does], here are a few things you need not fear or have sleepless nights over. A good number of folks prefer getting a date extension on their taxes, which will defer payment beyond the 15th. There’s nothing wrong in doing this. If you need more time to assemble your P&L, you have the legal right to a short-term extension of 120 days. All you have to do is call the IRS at 1-800-829-1040 [note the last 4 digits ~ apparently the IRS has a sense of humor]. And expense shouldn’t be a worry either, since there is no extra fee for extensions. While it’s always better to pay on time, the world won’t suddenly stop spinning if you don’t. If you can pay the full amount eventually, you can work out a payment plan with IRS. They will charge a one-time user fee of $120 for a request to enter into an installment agreement. If you set up a direct debit installment plan, the user fee will be reduced to $52. If you break your agreement by missing a payment but choose to reinstate it, or if you restructure the agreement, you will be charged an additional $45 user fee. If you default on an installment payment plan, additional penalties may be assessed and your credit score may suffer. So once you sign an agreement, stick to it. There’s a number of automated tax services that can help you avoid a hefty tax preparation charge that your accountant or a tax firm like H&R Block require. For instance, first-time filers with TurboTax.com can file a simple tax return for free, or if your tax situation is more involved, $54.99 for their Deluxe version and $79.99 if you will be reporting investments and rental property. As far as making mistakes, one should not panic. Everyone is entitled to making errors, and the IRS, contrary to popular belief are usually pretty amenable to working something out with you, if it’s an honest mistake. In fact, in most cases when you’re current with your past taxes and make an error regarding income or expenses, the IRS will often waive any associated penalty – so always ask the question, should you find yourself in that situation. 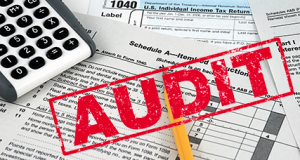 “In fact, less than 2% of individual returns are audited. That includes those filings that include hot button tax issues or are otherwise on the IRS’ radar,” notes Erb. “Do not live in fear of a tall man in a dark suit knocking on your door, unannounced, to perform an audit at your home or business: that just doesn’t happen,” adds Erb. Also keep good records. If you can prove the tax break was valid, you’ll be OK. People who work for themselves and file Schedule C do tend to get scrutinized a wee bit more, so spend a some extra time on your business record keeping. This is a reasonable fear. After all, the first-time homebuyer credit was changed three times three years. But what’s more important here is to accept the fact that doing your taxes is going to take some homework. So before you begin your return, peruse the countless websites, publications and online forums, like Bankrate tax center to learn as much as you can in advance. By staying current with tax law changes and filing tips, you’ll know some of the areas to be more cautious of than in year’s past. In 2015 for instance, there are some tax breaks that are dependent on your age. New parents can deduct pregnancy tests, childbirth classes, breast pumps and other birthing-related materials as medical expenses. Seniors over 65 could also deduct dental expenses if they exceed 7.5 percent of one’s adjusted gross income. Adapters to TV sets and telephones for the hearing impaired; artificial limbs, crutches, chiropractor services – a lot of this can also be deducted. This quote underscores the human condition. 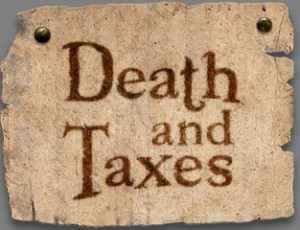 But both death and taxes are inevitable, so it makes no logical sense to fear the inevitable. What you don’t have to worry about in the 21st Century is there is no longer any such thing as Debtor’s prison. Yes, you can go to prison for purposely evading your taxes. But when you owe the IRS for back taxes, honest mistakes or forgetting to file, there are remedies. Death, on the other hand is another story. All I can tell you there is that while you can avoid visiting your accountant, it’s not wise to avoid seeing your doctors regularly. Happy Filing ~ Live Long & Prosper!